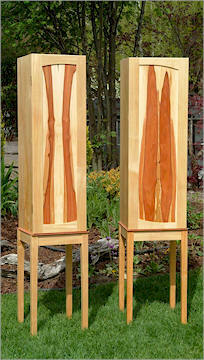 Fine Woodwork Lauren Waters is a fine woodworker and a forester, living in Revelstoke, British Columbia. Her furniture is thoughtfully designed and constructed to be enjoyed for generations. It has a distinctive style – contemporary, with organic curves that bring together her love of trees and art. Her work is both functional and sculptural.Her work has been shown in juried exhibitions, and in numerous galleries. She has won numerous awards including “Woodworker of the Year, 2006”. Commissions and gallery inquires are welcome.